I found it at the allegedly hunted-out trashy old park. It gave me a solid pulltab signal. It has some of the original bright copper luster on it. Hunting with the V3i, I got a very broken signal with no iron. While I was trying to figure out what it was, I kept getting a pulltab signal right next to it. The pulltab signal was at three inches deep while the broken signal was deeper but it kept changing from six to eight inches. I decided to dig the pulltab to eliminate the distracting mid tone and bam! out comes the 1920 D Lincoln cent! Whaaattt?!!! After reading Tom Dankowski’s excellent article on iron masking (http://www.dankowskidetectors.com/behindthemask.htm) , I think I know why the wheat cent gave a pulltab signal. I think that if I had inspected the area above and around the cent, I may have found a small iron piece laying above the wheat and off center. I am almost sure of it. 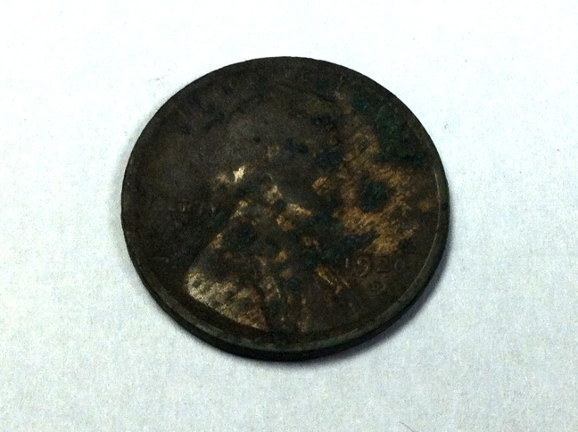 A 1920 D wheat cent at three inches of depth with a solid mid tone and a pulltab VDI. After I removed the cent, no signal was present. Later, I found another shot shell. This time it’s a USC Co Climax No. 10. Cartridge-Corner says that this shell was made from 1864 to 1926. 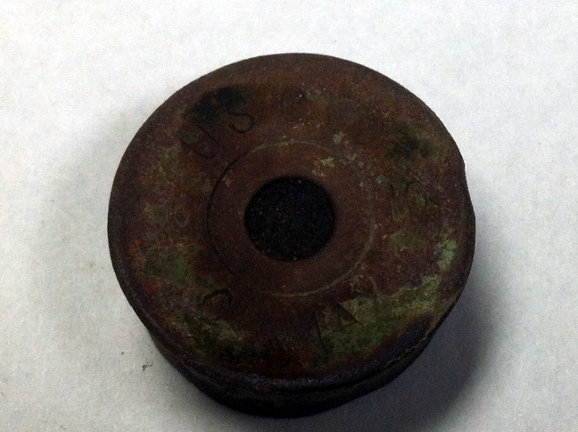 Again, given the history of the site (1901 houses, 1917 hospital) it is likely that the shell was dropped before 1900. So, I keep finding all this old stuff but no silver coins. Well except for the war nickel. Still, come on already! Where is my Seated?! wow… the article you linked to was great. One thing I noticed is that it was originally written 12 years ago. Has there been anything happen in detector technology over the that time frame that would have had an affect on the outcome? I am afraid as far as iron masking, the technology is stuck. Like Tom says, we still await a new paradigm in metal detecting to finally deal with iron masking.